We all get to that point in our lives that we are ready to take a step back from the hustle and bustle of everyday life, and just take it easy. In fact, it is something most of us look forward to. We work hard for years and years, saving and being cautious with our spending, making investments, sacrificing our time and sometimes our well-being, raising entire families. Then, one day, we are in a position to retire, choosing a spot to spend our autumn years in whichever way we choose. Well, one couple from England had recently come to this point in their lives. However, they did not settle for your run-of-the mill townhouse or flat in a retirement village. Oh no, they dreamed big, and made that dream happen. We are sure you will agree The Barn , as it is affectionately called, is an above-average home for anyone. We invite you to join us in taking a look at this impressive project, and to decide for yourself whether or not this is the ideal retirement home. Let's take a look! PARKdesigned Architects are the minds behind the The Barn, commissioned by the fortunate couple we have already mentioned. The clients approached the company to design a residential building in a greenbelt area in West Yorkshire, England. 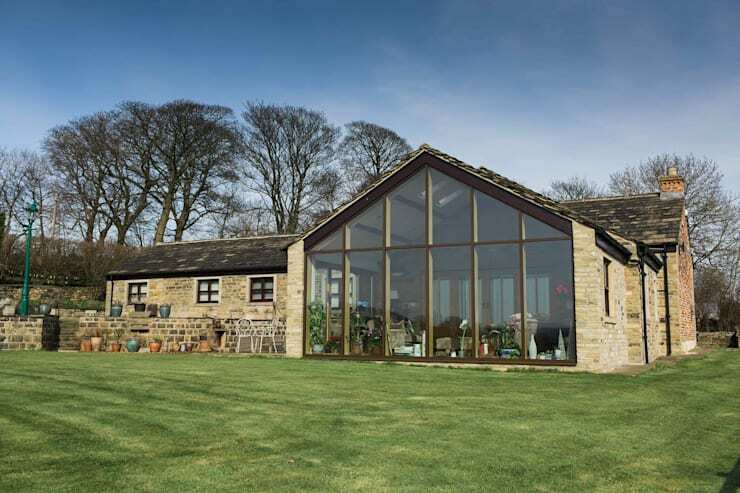 Since the firm is based in Leeds, they not only had an excellent understanding for the environmental demands and circumstances were the home would be built, but also for the cultural heritage of the area. The clients needed to down-size and streamline their lifestyle, as their adult children had just left the home, and they are in the process of retiring. With the commissioning of this project, they were thus not just looking for a home that they might sell in a couple of years, but were in it for the long haul. The architects were consequently commissioned with a project meant to last and adapt to the clients' needs over time, and this had influenced the entire home's design. As you can see, the building is quite an old structure which had been remodelled for this specific project. The building is an old English farmhouse, constructed of beautiful stone bricks in a countryside setting. To the right we can see the part of the structure that had been a barn in its previous life. 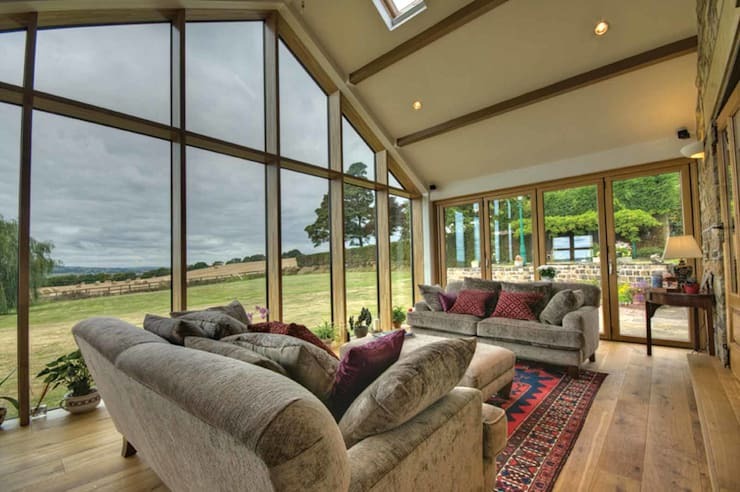 The brief for the project was centred around maintaining the open feeling of the barn (hence the name of the house), creating a modern and open-plan living space while retaining the heritage of the original structure. 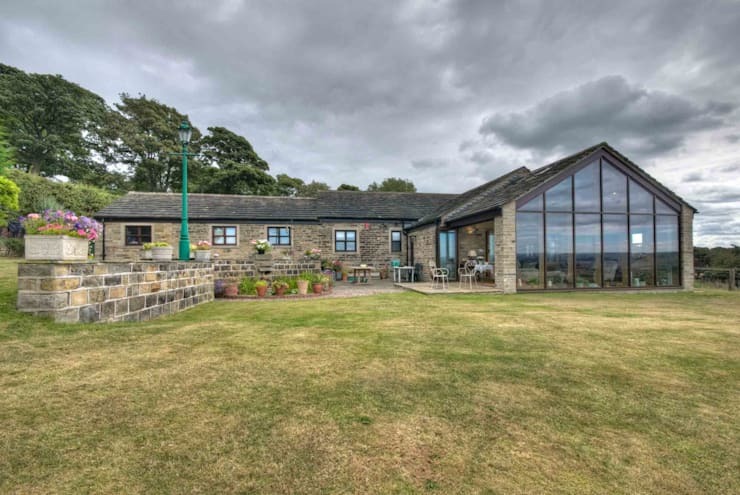 The front of the barn had been replaced with glass panels, offering an integration of the indoor space with the outdoors, and stunning views over West Yorkshire all the way to the Pennine mountains. This installation also serves to promote the open-plan ethic of the home. What's more, the glass panels fit neatly into the traditional gabled roof, ensuring that the full length of the facade is opened up onto the landscape. Not only is this functional in the plan, but it also creates an impressive effect for the home's facade. Now, let us take a closer look at what kind of materials were used in the construction of this home. As we have already mentioned the original stone-brick structure of the farmhouse had been retained and renovated. This ensures as warm, country-living aesthetic, and satisfied whatever longings may exist for the nostalgic. There is just something so beautiful about an old English farmhouse, especially when it is situated in the countryside with view such as these! The new materials employed to modernise the home are also worth mentioning. The glass panels used to replace the facade of the barn are glazed, in order to ensure temperature control and sturdiness. This is an important factor to consider when replacing such a large piece of external wall with glass! A wooden frame had been used to support the glass panels, and this seems like a great choice, since a more contemporary material, such as aluminium, might have felt out of place with the country aesthetic. Now that we have explored the exterior of the property and the building in detail, let's move inside and take a look at what the interior of the old barn house has to offer. Here we find ourselves in the living room, right at the end of the barn structure, and close up the glass wall. 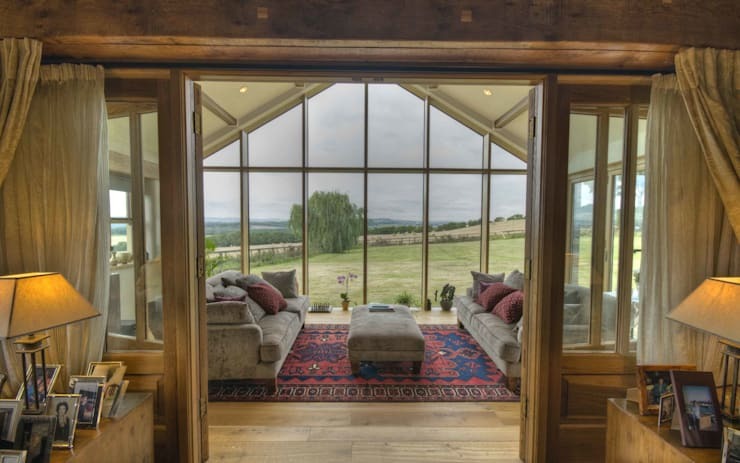 This is certainly the perfect location in the house to place the relaxation and social areas, as it is full of natural light and open the natural surroundings. The furnishing and decoration of this space is definitely worth noting. We can see that the designers wanted to create a sophisticated space that is at the same time very comfortable. There aren't many pieces of furniture, but the two large sofas are upholstered in a rich, velvety fabric that brings warmth and elegance to the room. The Persian rug and the crimson pillows adds that sense of luxury and makes the spot ideal for either entertaining or solitude. As we wave goodbye to the charming Barn, we get to see the full view that the lucky owners of this house will get to see every day for the rest of their lives, and what a view it is! 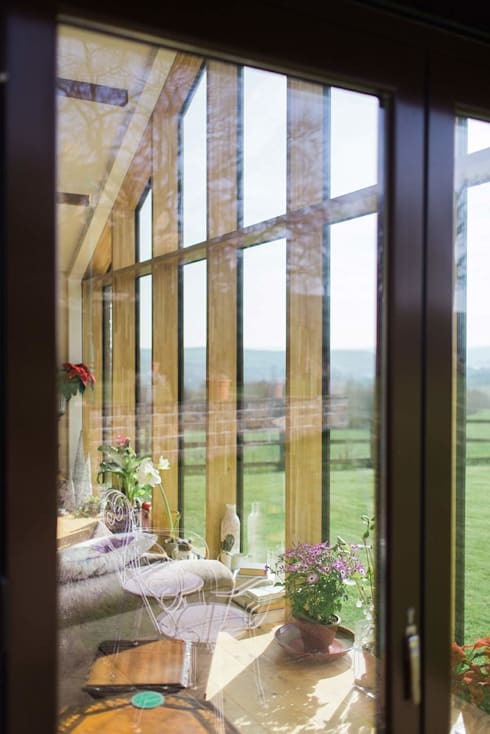 We can certainly see why the architects chose to replace the front wall of the barn with glass, and to make this area the living room. The panoramic view of the countryside is enough to make anyone want to settle on this spot! If you enjoyed this home, take a look at another fabulous English farmhouse—in a very unexpected location! Do you think this is the type of home you can retire with? What do you think of the house? Let us know!